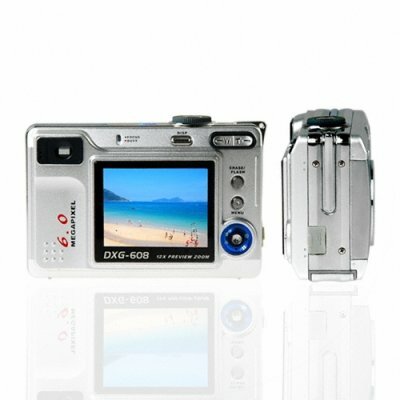 Successfully Added Professional Quality 6.0 Megapixel Digital Photo Camera to your Shopping Cart. Chinavasion Wholesale brings you a professional quality 6.0M pixel Digital Camera with the ability to interpolate the image to a excellent 10.0M. This Camera and Camcorder combo features digital zoom of 4x along with 3x optical zoom, rechargeable batteries, multi-format picture taking, and high FPS movie clips in AVI format. This Made in China Digital Camera has a metal design, is great looking, feels good in your hands, and has no M.O.Q. (no minimum order quantity). Note on Interpolation: Please note that this camera takes images in sizes equivalent to 10 megapixels. This is through a software resizing process on the camera called interpolation. The image sensor of this camera has a native resolution of 6 megapixels. This is the older version of the 6 MP digital photo camera. Please click here to see the latest version, in stock now.